Shrink Tunnel Heavy Duty|manufacturers and suppliers|in Mumbai,India. These industrial and heavy duty, rugged machine can be used for continuous and for long working shifts, without gap for chamber cooling. 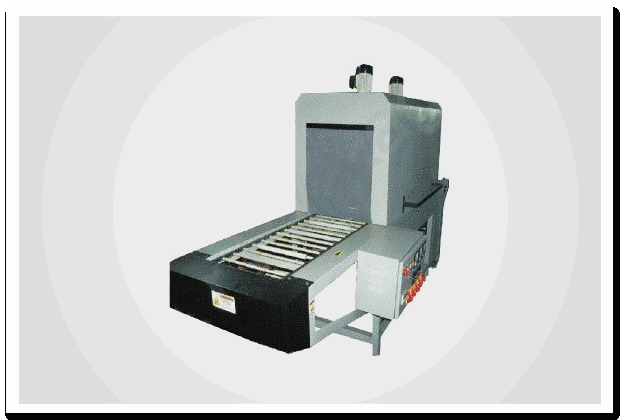 These machines are used to shrink wrap heavy products using LDPE / LLDPE shrink film with higher thickness. Live roller rod conveyors are provided in the machine, variable speed drive system for adjusting conveyor speeds, fully re-circulating heating air system enable lesser power consumption, highly efficient heat up with heaters provided on three sizes of the chamber, temperature controlled automatically, variable temperature controller, cooling chamber, options available are - stainless steel construction, variable speed drive for the blower, in-feed and out-feed extension conveyors, mesh type conveyor, roller type, teflon belt conveyor, slat conveyor for bottling applications.